Azeroth is a world brimming with conflict, especially on PvP servers. This means that, sooner or later, you will encounter members of the opposite faction. If you are in Friendly Territory, they won’t be able to attack you unless you decide to strike first, but be ready to fight to the death if you are in Contested Territory. Unlike traditional Battlegrounds, Lake Wintergrasp is an active ‘outdoor’ (non-instanced) zone. It can be fully explored: you are able to hunt the local fauna, harvest crafting materials, and receive PvP-related quests from NPCs near your starting area to turn in for honor and gold. However, at various points during the day (approximately every few hours), war rages through Wintergrasp as both factions struggle to control it. This struggle for control is ongoing – the last faction to ‘own’ Wintergrasp must defend the keep from their enemies until time runs out (default: 30 minutes). The attackers strive to break down the doors and claim the keep. Both sides use the war machines produced by opportunistic goblin profiteers. To reach Lake Wintergrasp, you can queue to join the battle from your PvP menu, or pursue a more scenic route, like taking a portal to the zone from the neutral city of Dalaran, flying to Wintergrasp via a flight master, or touching down on your own flying mount. Keep Wintergrasp is the primary objective of the struggle, and it must be captured to change the ownership status of the zone. Capturing the keep requires that a member of the attacking faction breach the keep doors and right-click on the relic located within. First, the outer and inner walls of the keep must be shattered – this is often accomplished with the vehicles available in goblin workshops (though some purchased or crafted bombs and charges can deal damage to walls too). The assault on Wintergrasp is bolstered by siege towers on both sides – 3 towers belonging to the attacking faction (located near the south of the zone), and 4 defending towers bordering the keep. Each tower includes a turret which can be commandeered by players of the appropriate faction (right-click on an unoccupied turret to hop in) and used to shoot at enemy players and vehicles. All towers can be destroyed in the same manner as keep walls: by attacking them with vehicle abilities. Each of the southern towers slightly increases the attacking faction’s damage; if they’re destroyed, those damage increases (‘buffs’) now apply to the defending faction – and, if all southern towers are destroyed, the amount of time remaining in the struggle will be notably reduced. Destroying enemy players, guards and turrets grants you a distinct rank (unique to Lake Wintergrasp). Increasing ranks permit you to access war machines at goblin workshops and become a more significant force in the battle. Goblin workshops located at key points on the battlefield can be used by either faction to unleash mighty vehicles. Most workshops are contested, and can be captured by ensuring that your faction has more players in the vicinity of the workshop than your enemies do (you’ll see a visual indication of how close the workshop is to your faction’s control). ‘Ranked’ members of your faction may deploy goblin war machines from a captured workshop. These vehicles can be piloted by any friendly player; right-click on them to hop in, and use the abilities displayed in their menu to do horrendous things to your enemies. 1-person vehicle that launches plague barrels to deal area-of-effect damage to vehicles, structures and enemy players. Catapults can also fire a jet of flame to deal solid damage to players or vehicles near the catapult. 3-person vehicle that hurls boulders to deal significant damage to vehicles, structures and enemy players. Demolishers are also able to ram nearby players, structures or vehicles, dealing significant damage. Two passengers (who are able to attack and be attacked) can also board a demolisher along with the pilot. 4-person vehicle that can transport a gunner whose cannon fire will deal significant area-of-effect damage to vehicles, structures and enemy players. Siege engines can ram nearby players, structures or vehicles for huge damage; they can also transport up to two passengers (who are immune to harm but cannot attack). Wintergrasp is a World PvP zone, similar to Tol Barad. It emphasizes siege weapon warfare–walls and towers are destroyed not by player damage, but by siege damage. Your siege engine amount is controlled by which workshops in the zone your faction owns. Every 2 hours 30 minutes, the battle for Wintergrasp begins. The defending faction must successfully defend for 30 minutes to keep it, while the opposing team attacks with siege weapons. Destroying towers both grants damage buffs and shortens the battle’s time by 10 minutes. Between battles, elementals spawn that players from the winning faction can easily farm for crystallized elements. Players can also fight the bosses inside Vault of Archavon which are very simple and drop a variety of tier and PvP loot. Players gain more honor based on the initial number of players they kill. Ranking up will also allow players to drive more elaborate siege vehicles: Siege Engines and Demolishers require the rank of First Lieutenant (10 kils). Players need to queue for Wintergrasp via the battlematers at major cities, or by entering the zone. You must be level 75+. In addition, players can only enter at a 1:1 ratio, preventing imbalanced battles on lopsided faction realms. Today, the struggle for control of the island and its grim penitentiary continues. Now that the Horde and the Alliance once again have a foothold in Tol Barad, whose blood shall be spilled into Baradin Bay? Unlike traditional Battlegrounds, Tol Barad is an active ‘outdoor’ (non-instanced) zone reachable through a portal in the capital cities (Horde: Orgrimmar | Alliance: Stormwind). 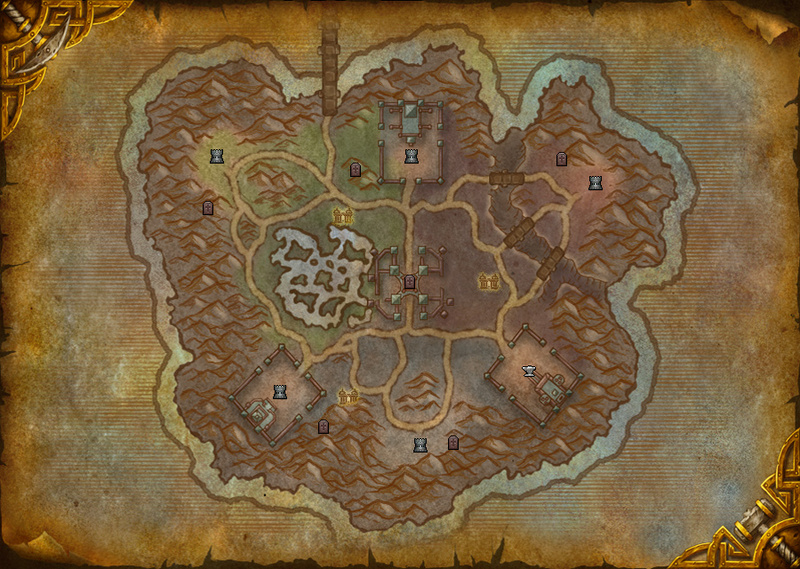 Traversing the hazards of Tol Barad’s unforgiving landscape is merely the first challenge; maintaining control of the prison and keeps will require your faction’s steel, spells, and continued vigilance! Every two and a half hours, a new battle is waged to test the dominance of the controlling force. To retain dominion of Tol Barad, defenders must prevent the enemy from capturing the three keeps during the time limit (fifteen minutes). If charged with the task of defending Tol Barad, your team will begin in the middle of the map and have possession over the three keeps: Ironclad Garrison (north), Slagworks (southeast), and Warden’s Vigil (southwest). If the defenders retain control of at least one of the three keeps when time expires, they will be victorious. Attackers, on the other hand, will not be content until they have wrested all three of these keeps from their enemies. Beginning at the bridge, the offense will need to divide their forces strategically to ensure that they are able to occupy these areas, assert their control swiftly, and possess all three keeps when the clock expires. The control of these keeps (visible as a progress bar on your screen) will fluctuate proportionally to the number of your faction’s forces fighting in the area: whichever side has the most players gains an advantage in the struggle. Beware, numbers alone cannot ensure victory. For every defending player killed within the vicinity of a keep, control will transfer markedly in favor of the attackers. There are three towers located along the perimeter of Tol Barad in the western, eastern, and southern plains. These pinnacles serve as optional points of strategic value that, if destroyed, will extend the duration of the battle for Tol Barad. Attackers can buy themselves additional time by assaulting one or all of the towers. Endangered towers can be a dangerous distraction for the defensive forces; if a tower falls, it grants the attackers an additional five minutes to assault Tol Barad (potentially doubling the original time allotment to thirty minutes if all three fall). Defensive players will have to prioritize the safety of the keeps versus the merit of limiting the game clock. And, although these towers are cracked and battleworn, they are still too massive for a player to bring down unaided. As luck would have it, the previous conflicts in Tol Barad have created a supply of abandoned war machines ripe for the taking. At the beginning of a Tol Barad battle, six abandoned Siege Engines will spawn for attackers to use. A set of two Siege Engines will appear near the Cursed Depths, The Hole, and D-Block (respectively). In order to drive a Siege Engine, you will first need to prove your battle prowess by achieving at least one honorable kill. Also, be on alert while driving the vehicle. You will not have any offensive capabilities, so you may want a convoy of allies to protect the Siege Engine if the defending team gets wise to your plan. When the vehicle reaches a tower, use its ‘Deploy Siege Mode’ ability to bombard the structure. You’ll be harmlessly ejected out of the driver’s seat as the Siege Engine begins to fire its cannons. After the tower is destroyed, the game clock increases by five minutes and you or your allies may take control of the vehicle again. Rather than needing to run to your corpse in order to resurrect, you’ll be periodically returned to life after a short countdown. Defenders will be resurrected atop Baradin Hold in the middle of the map and attackers will return to life in the vicinity of a nearby landmark. Tol Barad is a world PvP zone very similar to Wintergrasp. A battle starts on even intervals of time, and the winner of the match gains access to the Baradin Hold raid, as well as a number of special daily quests that grant reputation and currency. In addition to this, both winner and loser gain access to the standard quests in the zone. 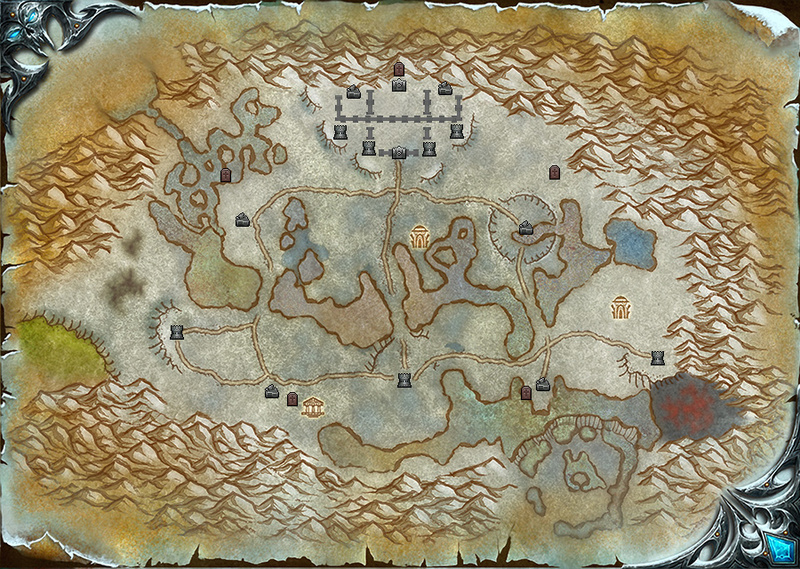 There are three destroyable towers, three capturable buildings, and three underground prisons for daily quests. Battles initially last 15 minutes with 2 hours and 30 minutes between battles. For every tower destroyed, the battle is extended by 5 minutes. The battle is won if the offensive team can control three buildings at the same time, or the defending team successfully prevents that for the duration of the battle. Towers are destroyed via siege vehicles–however unlike Wintergrasp, players can park these vehicles and dismount, as they will continue to do damage. Buildings are captured when a faction has more players near the flag–similar to tower captures in Eye of the Storm.